About a year ago at work, I left all current projects to pursue a new opportunity. I began an effort to prototype an idea that had started floating around. Along with one of our product managers, Steve, we iterated through prototypes and demonstrated concepts to various decision makers. It went all the way to the top. Yep, the big guy. The concept was a hit! In fact, most meetings ended with “When can I have it?” because it just made sense. So we set out to build and deliver in as short of a time frame as possible. And so today, Cisco announced it publicly and the real work begins. What is “it”? Well, we had seen the growing need for advertising the ability to connect Cisco TelePresence users with each other. I have Cisco TelePresence. But do you have Cisco TelePresence? And if so, how would we connect? The anecdotal case that was passed around was of the executive that flew across the county to meet with someone not knowing that a Cisco TelePresence system was available to the other participant right down the hall! With big multi-megabit data connections required for this full life-like experience, the behind the scenes isn’t like making an ole’ PSTN phone call. But our goal is to make it that easy for users! 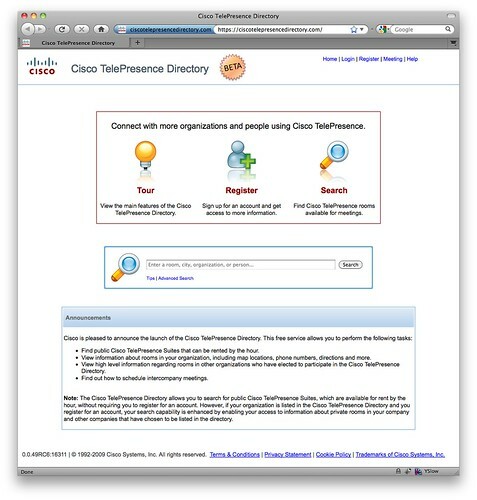 Enter the Cisco TelePresence Directory — a web application that does just that. Here is the press release from today — Cisco announced several products today so it isn’t just my hard work in there. Now, business users can find out which organizations, users and rooms are available around the globe for Cisco TelePresence meetings. It utilizes a powerful search engine so you can find resources by about any criteria you can think of. Think “Google meets the phone book”. If you don’t have Cisco TelePresence (yet! ), we have publicly available pay-per-use Cisco Public TelePresence Suites where you could go and have a meeting with someone anywhere in the world. Or there is this video of it with voice over by a smooth talking dude.